Rolling coverage of the Maldives presidential election. 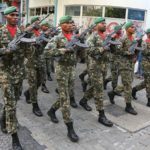 The Maldives Criminal Court Monday night released five prisoners who were arrested during a controversial state of emergency, the latest development in a tumultuous 24 hours for the tropical island nation. Earlier Monday President Abdulla Yameen conceded defeat to his opposition rival, Ibrahim Mohamed Solih, who won the country’s 2018 presidential election. The Elections Commission said the opposition candidate got 38,484 more votes than Yameen. EC chief Ahmed Shareef said there were no complaints or irregularities that could affect the outcome. According to election law, the official result must be announced within seven days. The period is for a verification process once all ballot boxes are sent back to EC headquarters in the capital. There were about 262,000 eligible voters and 472 ballot boxes, including five in four overseas locations. It was the third multi-party presidential election in the Maldives. Five prisoners freed. More to follow? Has Yameen left the building? 23:30 -The Criminal Court has released MPs Ilham Ahmed and Abdulla Sinan, along with former police chief Ahmed Areef, Gayoom’s son-in-law Mohamed Nadheem and ex-police chief and deputy leader of the opposition Jumhooree Party Abdulla Riyaz. All five were arrested on charges of terrorism during February’s state of emergency and were being held for trial. Lawyers filed habeas corpus applications to secure their release. But former president Maumoon Abdul Gayoom, his son Faris Maumoon, former chief Justice Abdulla Saeed, former justice Ali Hameed, and former judicial administrator Hassan Saeed were not freed. 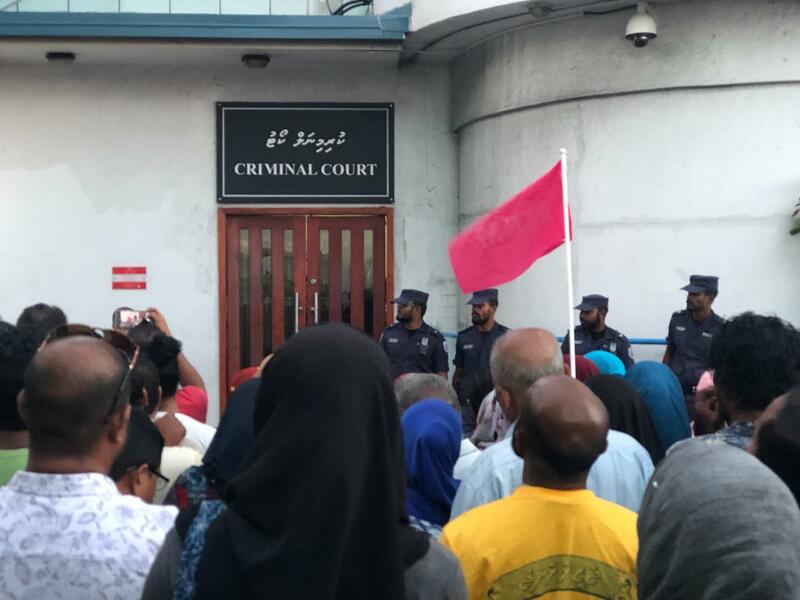 The court reportedly postponed decisions on previous remand orders issued to hold them in custody for the terrorism trial, as they were convicted on various other charges and are serving jail sentences. High Court hearings on the appeals on their convictions are expected to take place on Tuesday but have not been scheduled so far. 21:40 – India Prime Minister Narendra Modi has called Ibu to congratulate him on his victory. He invited Ibu for a meeting as soon as possible, the Maldives president-elect told Raajje TV. Ibu accepted the invitation and Modi expressed his wish to repair strained relations and pledged assistance to restore democracy. 18:45 – In the last few hours hundreds have gathered at Malé Criminal Court to get a glimpse of former president Maumoon Abdul Gayoom. He was jailed in June for obstruction of justice – his family have been trying to get him transferred to house arrest because of his age and ill-health. “Our aim should be to make this a very successful government. A government that paves way for what the people want. 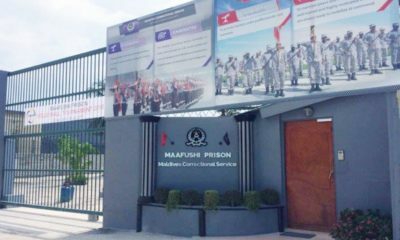 Other prisoners with hearings are Faris Maumoon, Gayoom’s son and Yameen’s nephew, and Mohamed Nadheem, Gayoom’s son-in-law. Yumna Maumoon, Gayoom’s daughter and Nadheem’s wife, is at court as is her mother Nasreena. People were shaking Yumna’s hand, saying her father would soon be released. The crowds are demanding Gayoom’s release and for Yameen to be arrested. 14:45 – The ruling party is having a huddle with Yameen. PPM Council Underway with Musthashaaru HE Yamin Abdul Qayoom at PPM HQ in Male’. 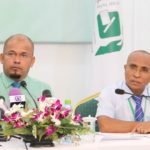 – The Human Rights Commission of the Maldives says the presidential election was conducted freely and fairly. 14:20 – More local media headlines! 14:00 – Prominent lawyer Maumoon Hameed says he is seeking the immediate release of three high-profile prisoners. If you want to know more about who is locked up in the Maldives or in exile and why click here and here. 13:30 – “My five-year term has been a period in which we faced a lot of difficulties,” Yameen said in his concession speech. “I believe that no other president has faced any such difficulty. However, in every instance, I worked for the rights of the people. Every time I faced issues, which if I had given in to them, the rights of the people would be compromised. I worked to uphold the rule of law, and to prevent the effects of illegal acts from being felt by the people. “There was a strong team who did sincere work with me. There were lawmakers who worked with me. I was helped the most, politically, by my wife. My wife and her team have been continuously doing strong work for three or four years. So, I sincerely would like to thank Madam Fathmath and her team. “In the PPM office, under the two vice presidents, important work was being done. I sincerely thank this team. This team includes parliamentarians and councillors as well. I would have not been able to do any work, at all, if my cabinet had not cooperated with me. I am proud of that team. “In front of the Maldivian people, my work was sincere. But yesterday the Maldivian people made their decision about me. So I have decided to accept the results and stay in service to the people in any way I can,” Yameen said. Ahmed Nihan, who was earlier a little churlish about the poll outcome, has started sending emojis to the president-elect. 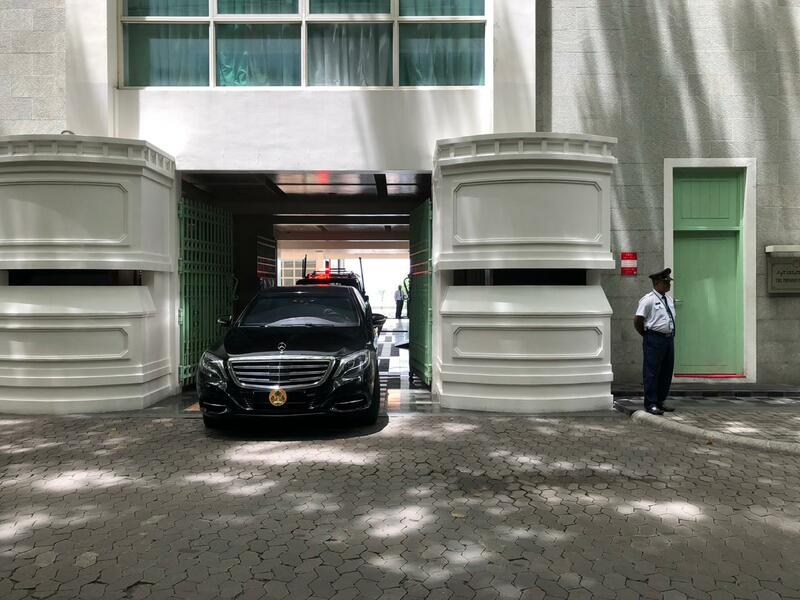 12:45 – Maldives Independent reporters say a liveried vehicle left the President’s Office moments ago. Only the state-run PSM was allowed inside the building for Yameen’s concession speech. 12:35 – Yameen concedes defeat! In a televised statement, he began by defending his track record. There was a need for a law to combat defamation. The administration had served the needs of the youth and elderly. He thanked supporters who valued his service, alleging that they did so after refusing gifts or inducements. “The Maldivian people made their decision yesterday. I have accepted that result,” he said. More on his statement as we get it. 12:30 – Yameen will address the nation shortly, says his spokesman. 12:10 – The Maldives press packed legged it to the President’s Office because election winner Solih went there – presumably to meet Yameen. While that was happening Yameen’s running mate congratulated Ibu, saying he was certain of the “positive changes” to the country under Ibu’s leadership. “I urge the beloved Maldivian people to unite and help Ibu govern the nation. Forward the Maldivian nation.” An English version of the tweet is here. There was also a reaction from Ahmed Nihan, who did not quite pat Ibu on the back. Fortunately UK ambassador James Dauris had something nice to say. It's great to see @MDVForeign and @ElectionsMv announcing the preliminary results of yesterday's election so quickly. 11:15 – The US embassy in Colombo has congratulated the Maldives and Ibrahim Mohamed Solih. We welcome the announcement of official #MaldivesElection2018 results by @ElectionsMv and congratulate all Maldivians on the outcome. We look forward to a peaceful transition of power and will work with President-elect @ibusolih’s government to further strengthen bilateral ties. 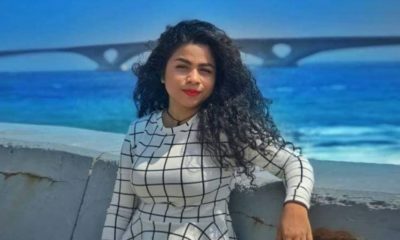 Former foreign minister Dunya Maumoon, who is the daughter of jailed former president Maumoon Abdul Gayoom, has urged her uncle (President Abdulla Yameen) to “concede to the will of the Maldivian people.” Want to know more about this family? Click here. 10:50 – A major breakthrough in government reaction with the Maldives Foreign Ministry acknowledging the election result and calling Ibu president. “Candidate of the Maldivian Democratic Party, Member of Parliament Honourable Ibrahim Mohamed Solih, won the election, having received 134,616 votes. The President and Vice-President, elected today, will be sworn in on 17 November 2018,” reads a statement. Still nothing from the sitting president. 10:00 – German ambassador Jörn Rohde told the Maldives Independent he was happy the election was conducted in a calm and peaceful manner, noting the opposition candidate had “clearly won” according to local media and NGO reports. 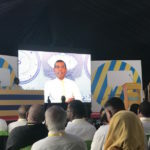 “The election results expressed by the Maldives people need to be fully respected and… it is paramount for all stakeholders to maintain an environment conducive for a peaceful transfer of power,” he said. Speaking of local media, here is a round-up of post-election headlines. Enjoy! 09:45 – The first government reaction has come from Fisheries Minister Mohamed Shainee, who previously predicted the ruling party would win “above” 70 percent of the vote. The c word – concede – is not mentioned his tweet however. Its a new day, beginning of a new chapter to me and this Nation. This is politics. May Allah s.w.t bless this country, forgive our wrong doings, give strength to our leaders to resist the temptation to disbelieve, keep this Nation independent forever. His calls for forgiveness have been shot down by opposition lawmaker Eva Abdulla. 09:20 – The Elections Commission has endorsed the total tally of provisional results from polling stations. President Abdulla Yameen has 96,132 votes. Ibrahim Mohamed Solih has 134,616 votes. The total valid number of votes were 230,748. The invalid votes were 3,129. The total votes cast were 233,877. The turnout was 89.22 percent (of 262,135 eligible voters). The margin of victory in 2008 was about 15,000. In 2013 it was about 6,000. 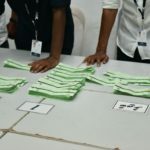 07:30 – India’s Ministry of External Affairs is also in celebratory mood: “We welcome the successful completion of the third Presidential election process in the Maldives which, according to preliminary information, Mr. Ibrahim Mohamed Solih has won. “We heartily congratulate Ibrahim Mohamed Solih on his victory and hope that the Election Commission will officially confirm the result at the earliest. “This election marks not only the triumph of democratic forces in the Maldives, but also reflects the firm commitment to the values of democracy and the rule of law. In keeping with our ‘Neighbourhood First’ Policy, India looks forward to working closely with the Maldives in further deepening our partnership.” Want the background on India and the Maldives? Click here. 07:00 – Morning. State-owned Public State Media has been broadcasting the provisional results count from the Elections Commission. 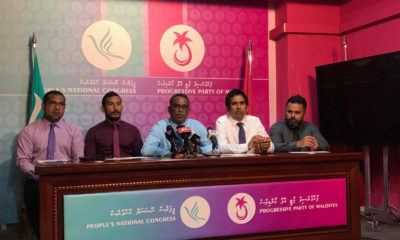 There has not been a peep from the ruling Progressive Party of the Maldives or the President’s Office even though there were indications earlier that the PPM would abide by the outcome. Even PSM gives Ibu 58.27 percent of the vote and President Abdulla Yameen 41.73 percent. The stream of the results is here. 01:30am – All eyes are on the Elections Commission, with its chief saying the vote went smoothly and peacefully and thanking candidates for their cooperation. “Tonight we will begin announcing the provisional results of the presidential election 2018,” Adam Shareef tells a news conference. “We will announce the official result within seven days as required by law. As I have said before, the official result will be announced before September 30, Sunday.” The EC will give the results, one ballot box at a time, before giving a total (provisional) tally. 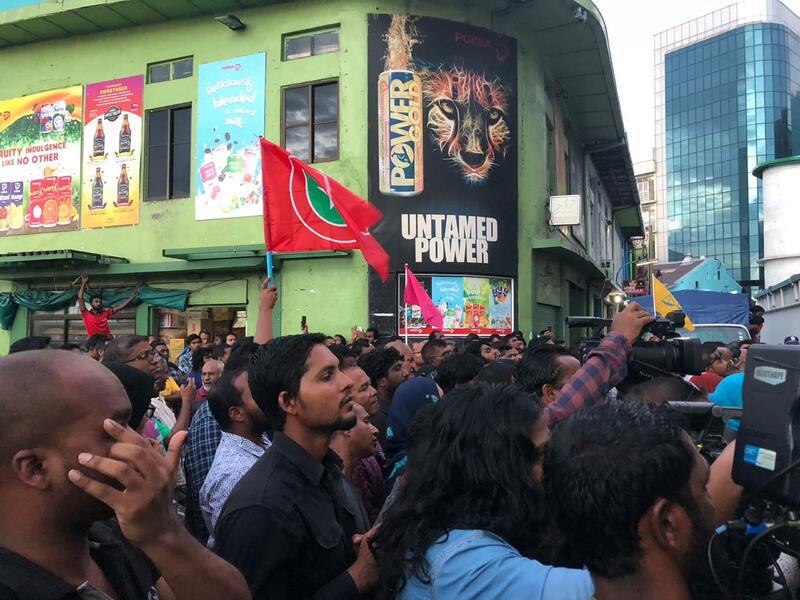 01:00am – Opposition supporters take to the streets in the capital to celebrate and congratulations pour in for Ibu, as the Elections Commission holds a press conference. 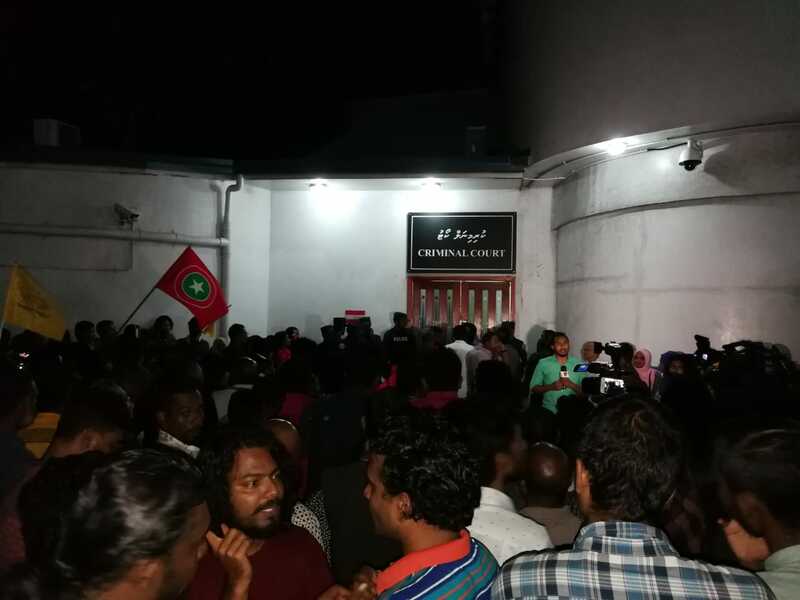 Hundreds are outside the Maldivian Democratic Party’s campaign centre, calling on the president to concede and chanting Ibu’s name. Congratulations to President Elect @ibusolih. You have done an extremely good service to not only to the people of Maldives, but also to freedom loving people everywhere. Democracy is a historical inevitability. 00:30am – Ibu is at his campaign office, which was the scene of a police raid on Saturday. He declares victory and says: “This is a moment of happiness, a moment of hope. a moment of history. For many of us this has been a difficult journey, a journey that has led to prison cells or exile. “It’s been a journey that has ended at the ballot box. I must thank all those people who have struggled for this cause.” He pledges to be a president for all Maldivians, regardless of who they voted for. 11:41pm – Elections Commission spokesman Ahmed Akram refused to comment on the results announced by media. The EC will begin announcing provisional results shortly. 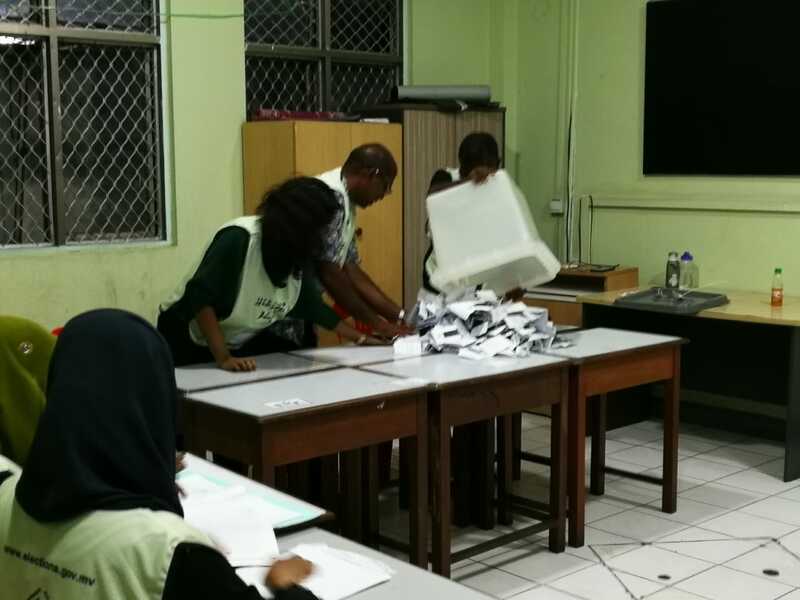 11:35pm – With 90 percent of the 472 ballot boxes counted, Ibrahim Mohamed Solih has a lead of about 30,000 votes, approximately the number of votes left to count. Civil society groups and media outlets have called the election for Ibu. Thank you very much the people of Maldives. Together we won and together we can build a better future for generations to come. Alhamdhulillah. 10:26pm – With more than half of ballot boxes counted, opposition figures have started congratulating “president-elect” Ibrahim Mohamed Solih. 8:40pm – More results are coming in an hour after vote counting started. 8:26pm – State media has started reporting with boxes that show President Yameen in the lead. 8:11pm – Media outlets have started reporting results relayed by their monitors at polling stations. The first results of the night came in from resort ballot boxes with Ibu leading with above 80 percent on most islands. The state-owned Public Service Media has not reported any results so far on their live coverage. 7:46pm – Elections officials are using UV lights to check ballots during the counting process in some polling stations, according to media reports. 7:42pm – Vote counting is under way in most polling stations. MPS is pleased to state that #MvElection2018 voting queues have officially been closed with no violence and minimal complaints from the public. Thanking Maldivians for your cooperation and your service to the nation. 7:26pm – With vote counting due to begin, people are on the streets in Malé’s main thoroughfare. When it started raining, raincoats were handed out. Food parcels are also being distributed. The opposition coalition has urged supporters to remain on the streets near polling stations until results are announced. 7:15pm – Queues are closed and vote counting will begin half an hour after the ballot boxes are sealed. 7:05pm – Elections officials are closing ballot boxes in polling stations where there are no queues. Voters can no longer join the queue after 7pm. 6:58pm – Polls are due to close in two minutes but people in the queue will be allowed to vote. There are still queues outside some polling stations in Malé. 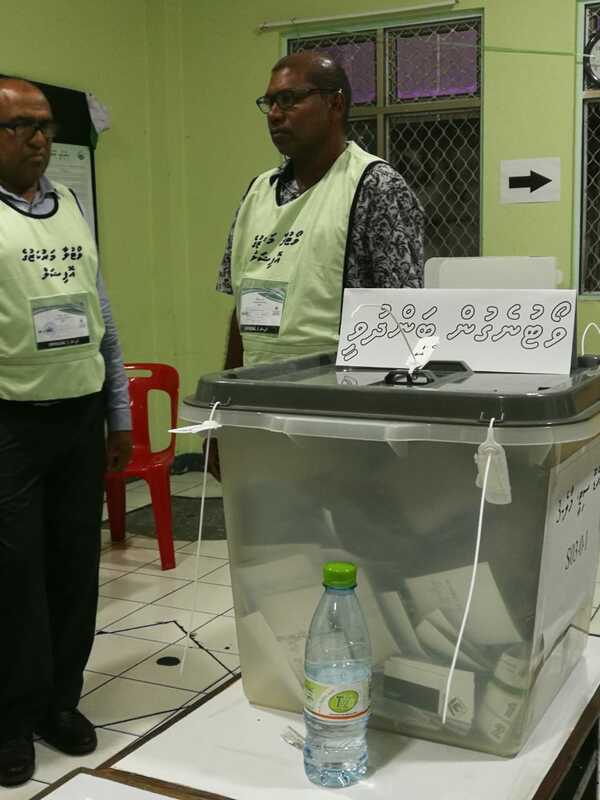 A voter told the Maldives Independent he just voted in an Addu City ballot box after waiting in line at the City Hall in the capital since 2:30pm. Election law states that those waiting in line by the time polls close are entitled to cast their vote and that ballot boxes should be sealed once everyone in the queue has deposited their voting slip. 6:37pm – Opposition figures are sharing allegations on social media about gangs planning to attack polling stations to disrupt vote counting. Earlier in the day, the Meraki coffeeshop in Malé closed down after a group barged inside and threatened customers. We are closing Meraki down because of threats to our customers, staff, and property by a group of young men who barged into our cafe’. Sincere apologies to those that were affected by it. 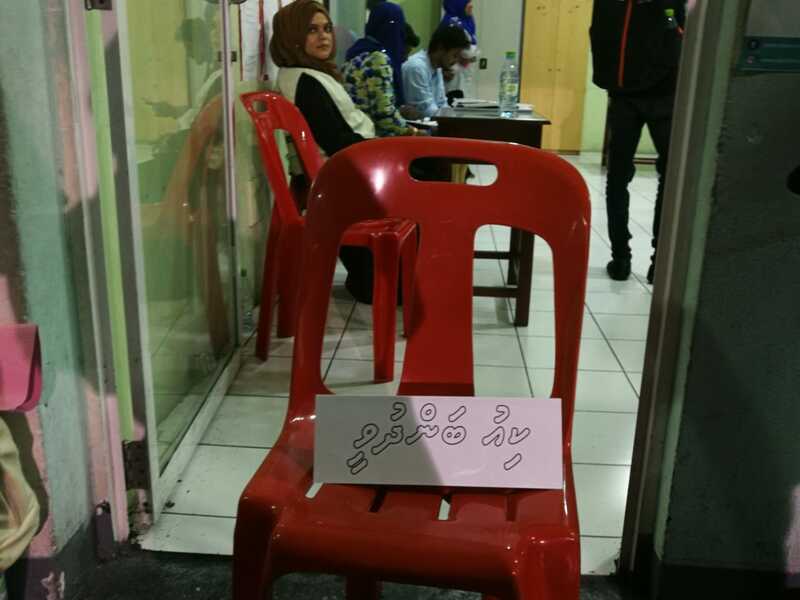 6:30pm – NGO Women & Democracy, which has been observing the polls, have reported several irregularities, including the names of three deceased people on the list of voters in Lhaviyani Kurendhoo and one deceased person in Haa Alif Utheem. The names on the Kurendhoo list were removed. An extra ballot box was “kept aside” at a Gaaf Alif Kolamaafushi polling station and a woman’s name was missing from a Machchangoalhi North ballot box. But she was able to voter after the NGO assisted her with lodging a complaint. 6:12pm – With less than an hour before polls close, crowds have thinned out at most polling stations in Malé. 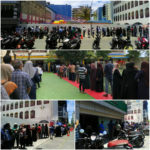 There are no long queues of people standing outside schools and government buildings, including Huravee building, Gaazee building, Dharumavantha School, the customs building, and the department of examinations. 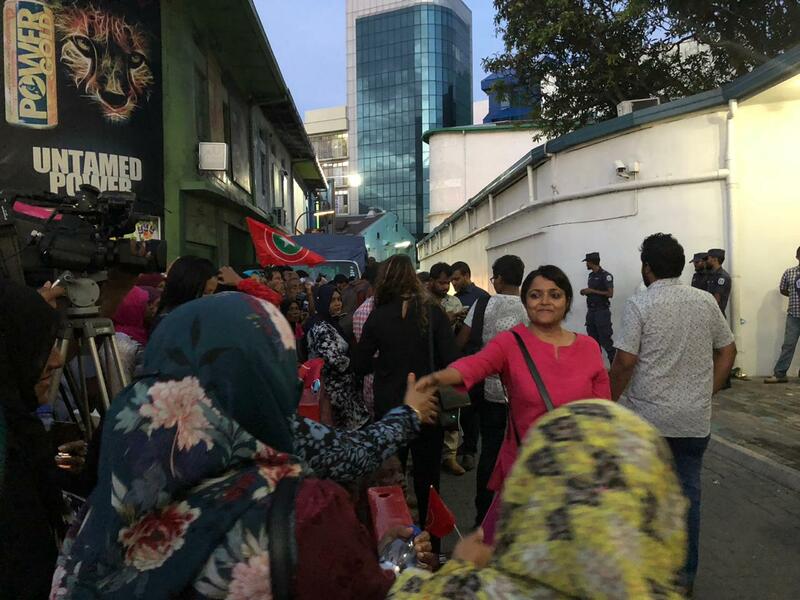 5:18pm – A voter in Colombo told the Maldives Independent he waited in line for eight hours to cast his ballot. The situation was similar in Kuala Lumpur, where people fainted while waiting, and some voters have been waiting for more than eight hours. 5:02pm – According to Raajje TV, which has monitors throughout the country, the turnout on most islands has reached 85 percent. With polls due to close in two hours, there are no queues at most polling stations. 4:43pm – Azleen Hassan, vice president of the opposition Maldivian Democratic Party’s Gaaf Alif Villigili branch, was arrested while he was in the queue waiting to vote on the southern island, a police spokesman has confirmed. 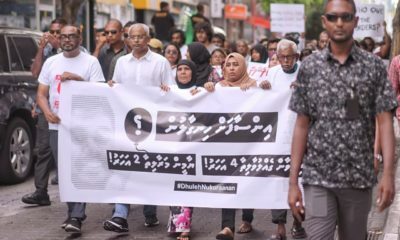 A source familiar with the matter told the Maldives Independent that police had been searching for him since a warrant was issued for his arrest a week ago. 4:o1pm – None of the monitors registered by Raajje TV to monitor polling in jails has been allowed into prison polling stations. The station has filed a case with the EC complaints mechanism: COO Hussain Fiyaz Moosa. “No major problems reported,” police tweeted around 3pm. 3:58pm – The Elections Commission does not have an update on the turnout, which reached 38 percent by noon, according to spokesman Ahmed Akram. More than 100,000 people cast their ballots by 12pm. 3:48pm – The Elections Commission has extended the closing time from 4pm to 7pm amid complaints about long queues at polling stations. The decision was made at an official meeting of the five-member electoral body, it was announced less than half an hour before polls were due to close.